From Fort Stevens, it was a nice ride through Astoria and then east of Portland to Troutdale on Route 30. A local at our campground recommended the Mt. Hood Scenic Loop and we were glad we tried it. 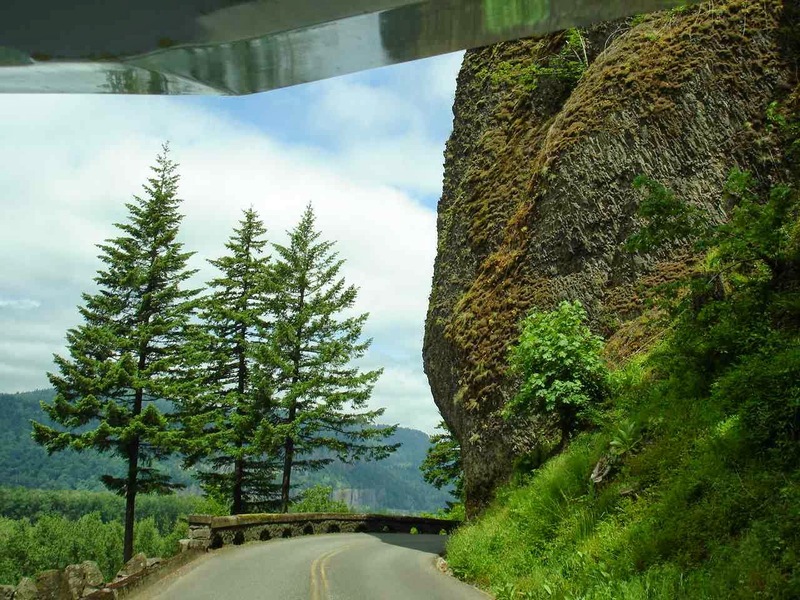 A very scenic ride on Route 26 to Route 35 and back to Interstate 84. It began immediately with fresh picked strawberries right at the strawberry patch. The many views of Mt. Hood started quickly. Some beautiful views of Mt. Hood along the way. This was right before the Mt. Hood parking lot along the 6 mile road up to Timberline Lodge. Lady Blue was quite comfortable with the climb. The parking lot is busy. Most of these cars belong to snowboarders and skiers enjoying a run down the mountain. 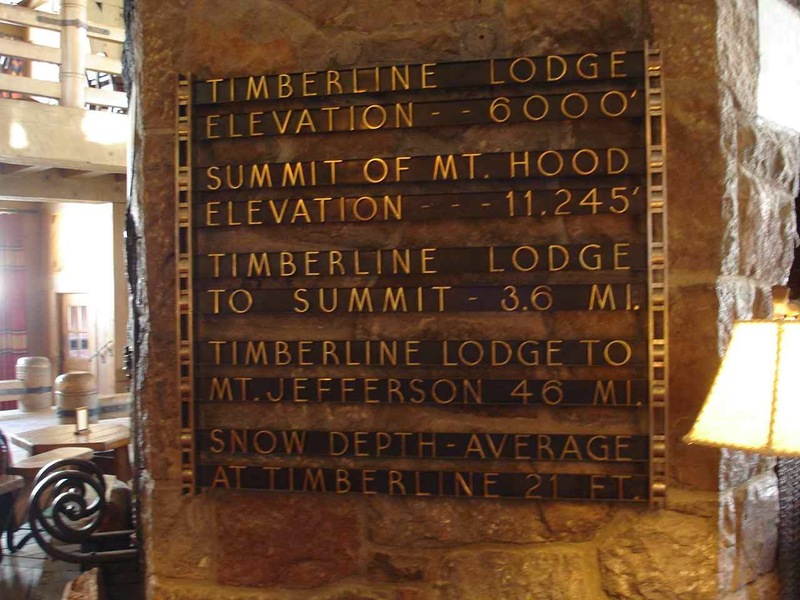 Timberline Lodge is a short walk to the left ahead and the lifts are right there. 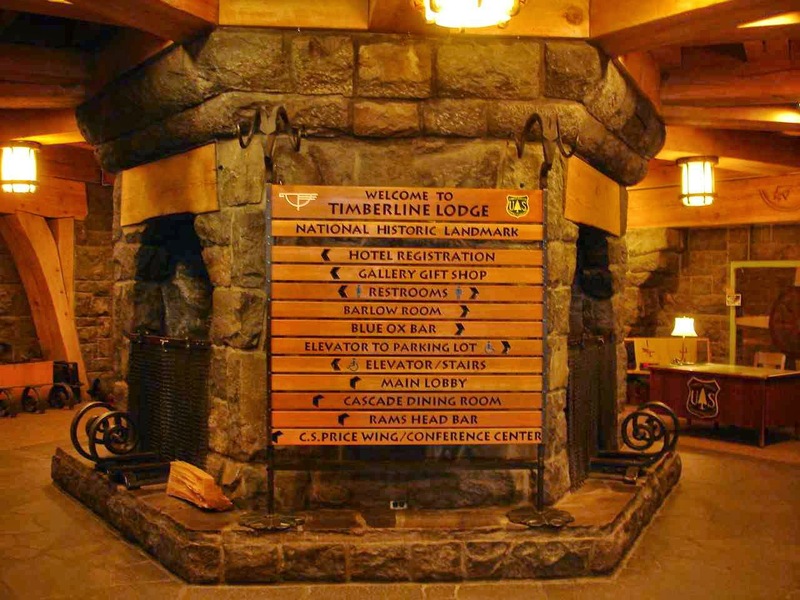 The interior is welcoming and warm with lots of fireplaces. This is the original lodge built under the WPA in the 1930's. With so many lumber workers and others out of work in the depression, there was no problem finding workers to build this in 15 months. 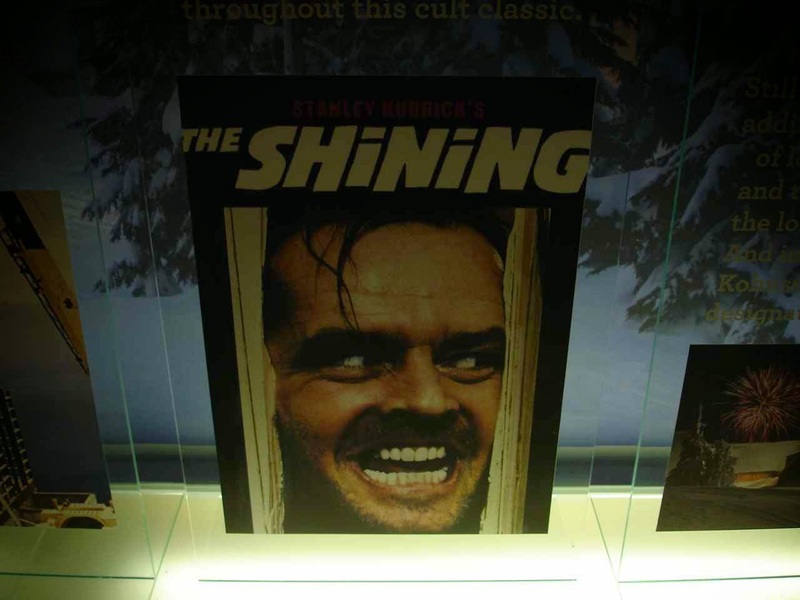 If the above was looking familiar to you, you might have seen it in a few exterior shots from The Shining with Jack Nicholson in 1980. This is a display showing a room set up in the 1930's. 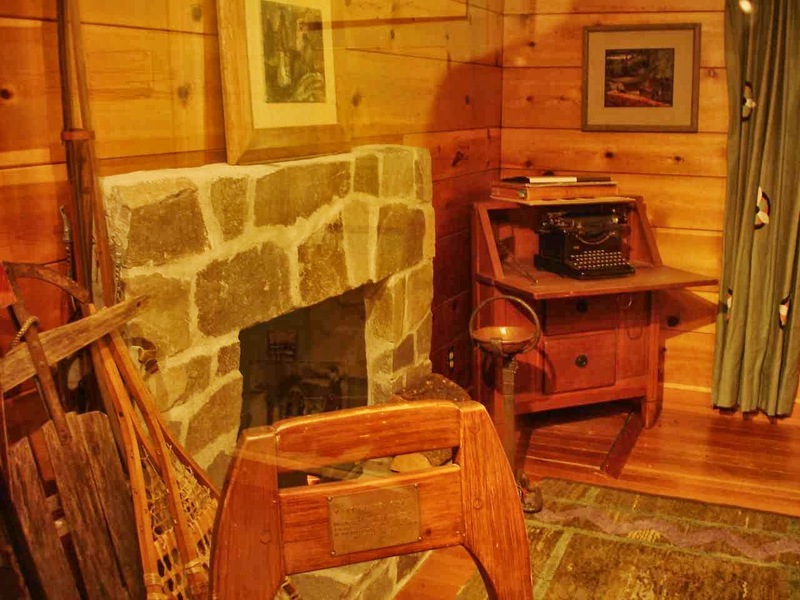 Even more comfortable when you see that welcoming fireplace and the typing desk with the old typewriter. I shouldn't say "old", because it looks exactly like the typewriter I used for homework during the high school years. 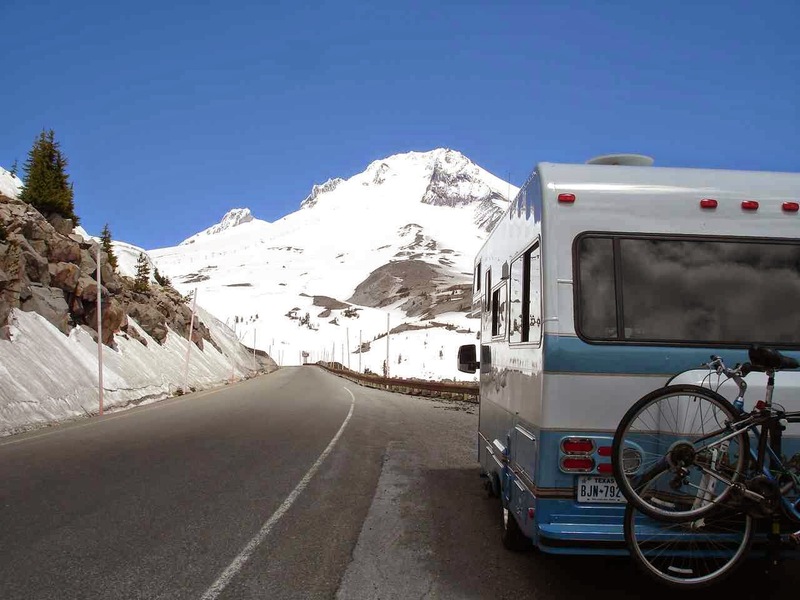 Yes, Lady Blue is parked outside at 6,000 foot elevation. Jan and I are quite impressed that Marsha and Mark climbed to that 11,245 foot summit a few years ago. Can't believe that Dave is going to do it at the end of next month!! 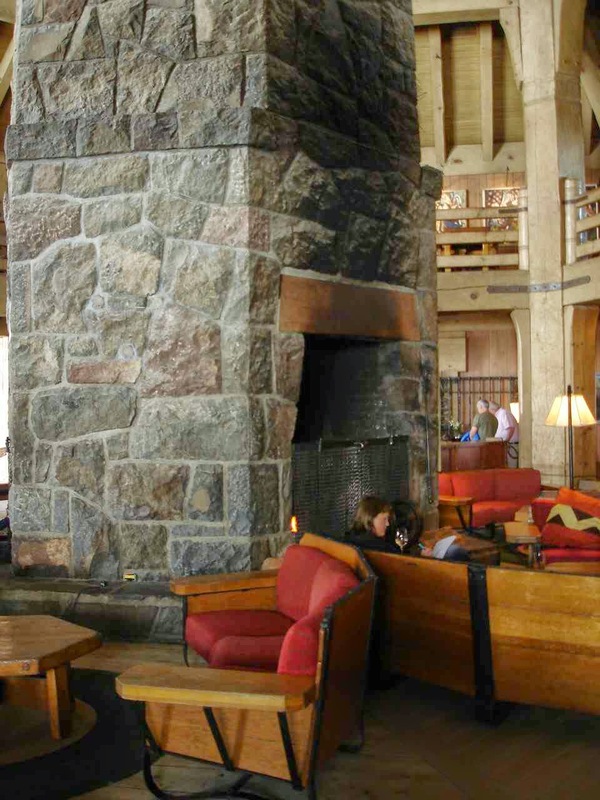 The original lodge has comfortable spots like this lounge with a fire in the fireplace. I believe that is a glass of white wine being enjoyed-----hmmmmm? At the original building is a very nice full service restaurant and an even nicer bar/lounge with great views out to the mountain or over to Mt. Jefferson, also snow covered. Not to be missed , if you do the Mt. 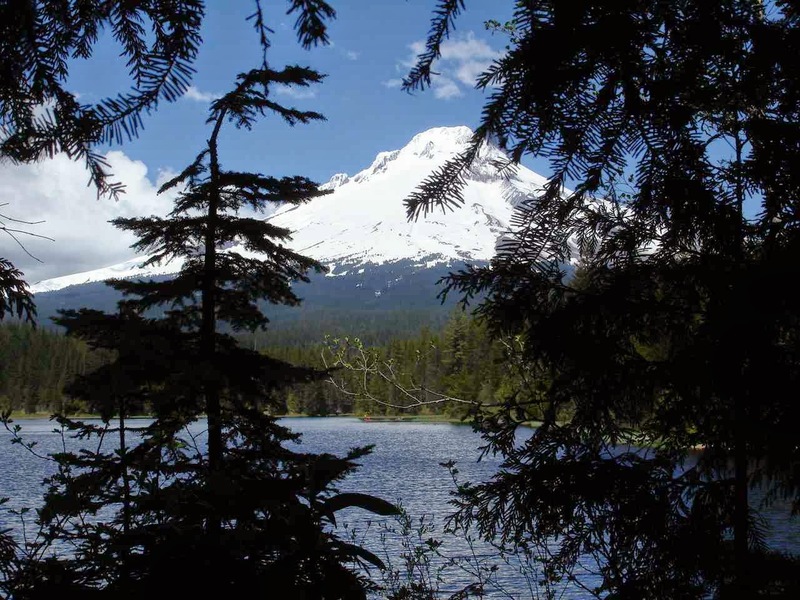 Hood scenic loop, is this view from the quiet Trillium Lake . It is almost right across from the Mt. Hood road on route 26. Sometimes, you will have a mirror image of Mt. Hood. 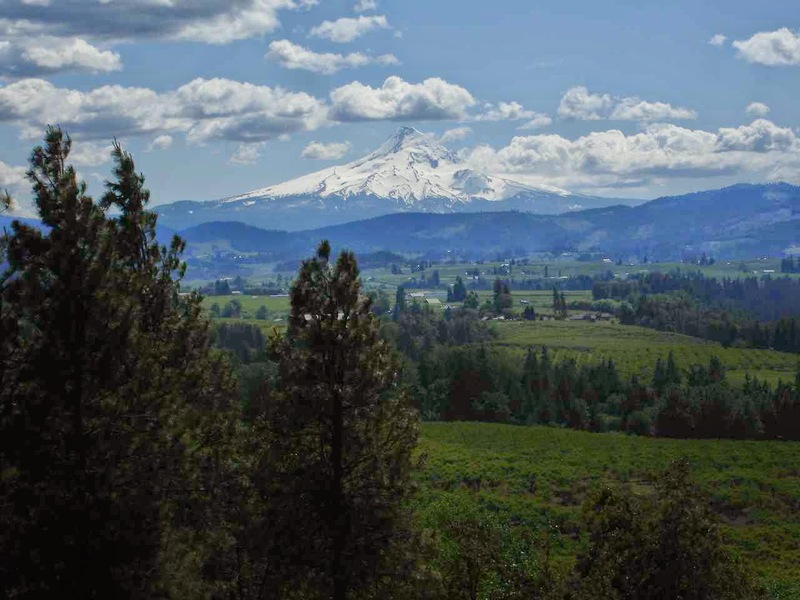 Another great view is from Panorama Point, right off Route 35 in Hood River. It was a little hazy this day, but still a good look at Mt. Hood. Also had a good view of Mt. Adams in Washington state. Jan and I had doubts about going all the way back to Troutdale after the Mt. Hood loop. 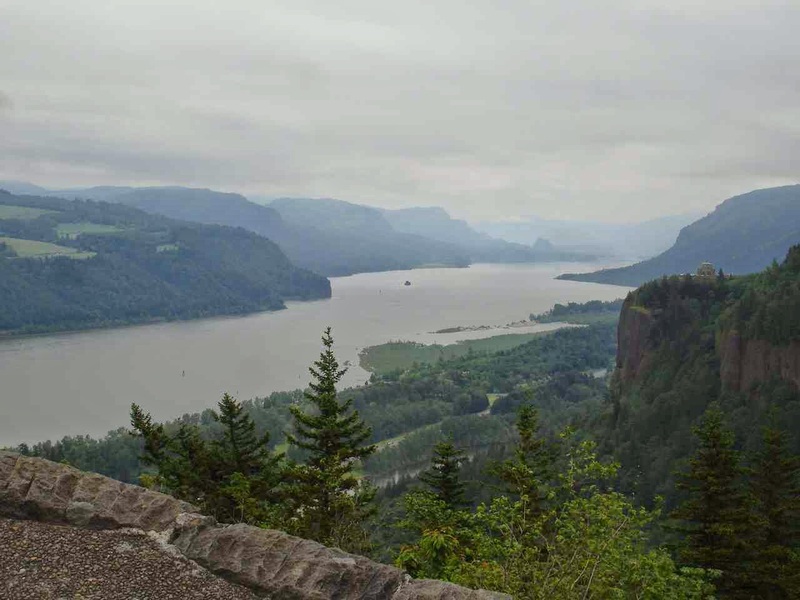 But , we thought it was a good decision when we started the next day on a scenic tour down the Columbia Gorge on old Route 30. 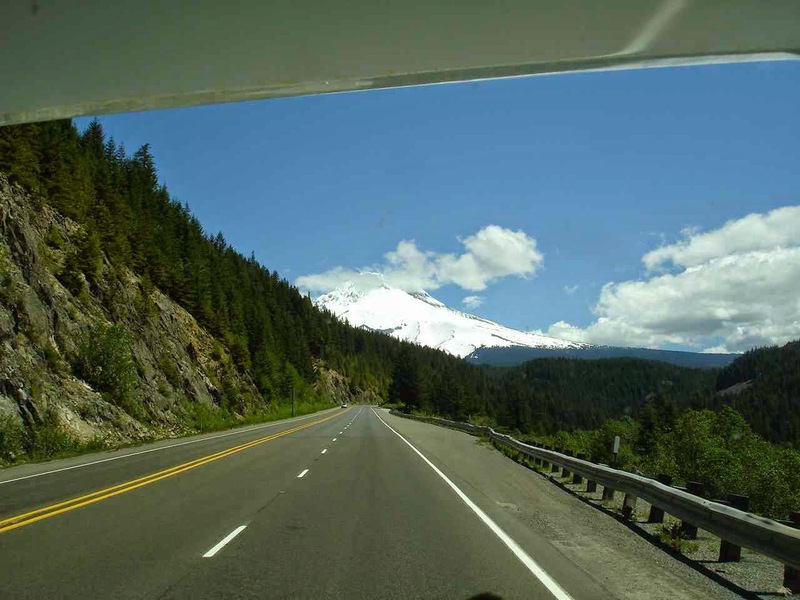 Route 30 was the first scenic highway in the US built under the direction of Samuel Lancaster,engineer, in 1913. The idea was to "not mar what God had put there" and to showcase waterfalls and other "beauty spots" along the Gorge. 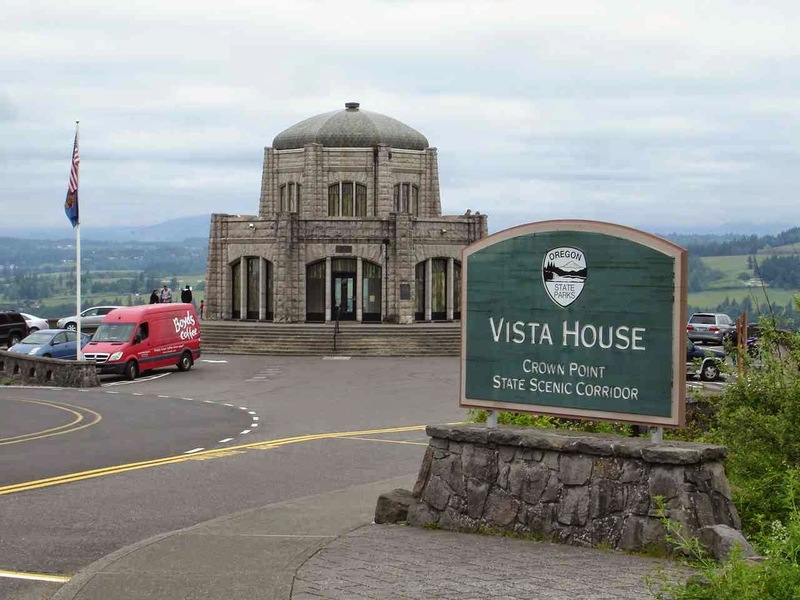 This is the Vista house, set at a high point along the Columbia River as a rest stop. If you stop by, take the time to look upstairs and downstairs at this beautiful building. Oregon State Parks took over this building and renovated it. This is just the view west towards Portland. As a road built in the early 1900's, you soon realize that it was not meant for modern, larger vehicles. While a limit of 40 feet is indicated, one lane bridges, tight S curves, and corners like this one might prove difficult in larger RVs. Especially with traffic. Lady Blue was very cautious!! 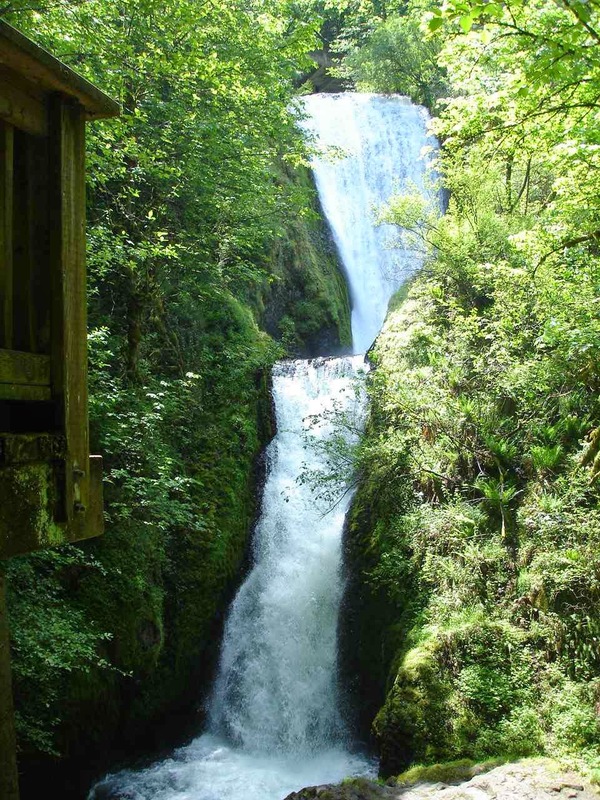 Along this scenic route is supposedly the greatest number of waterfalls in the US. We did not stop at all of them. Some of the falls had very small parking lots and there were a number of tourists. But, it was also on a weekday, so we found some nice stops like Bridal Veil Falls. 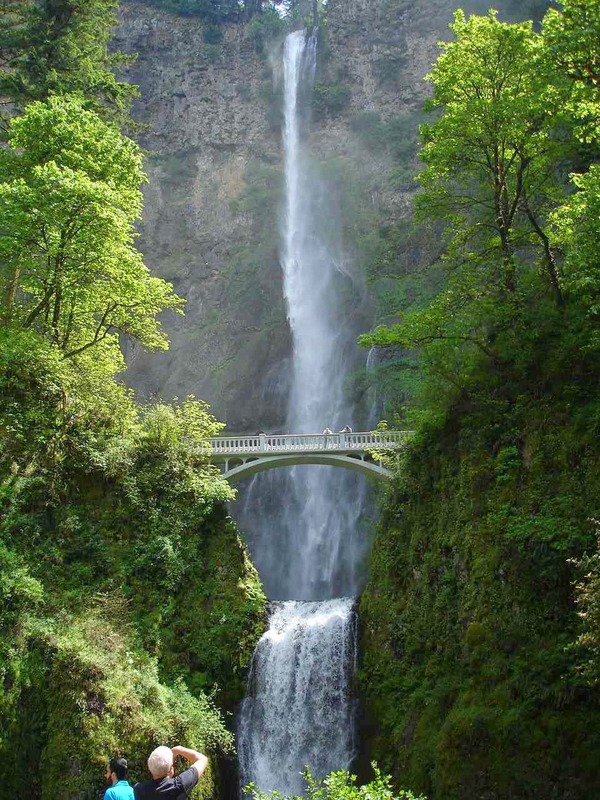 The most popular and largest falls are Multnomah Falls. There is a large parking lot on Route 30 and an even larger lot on Route 84. I believe this is the fourth largest falls in the US. 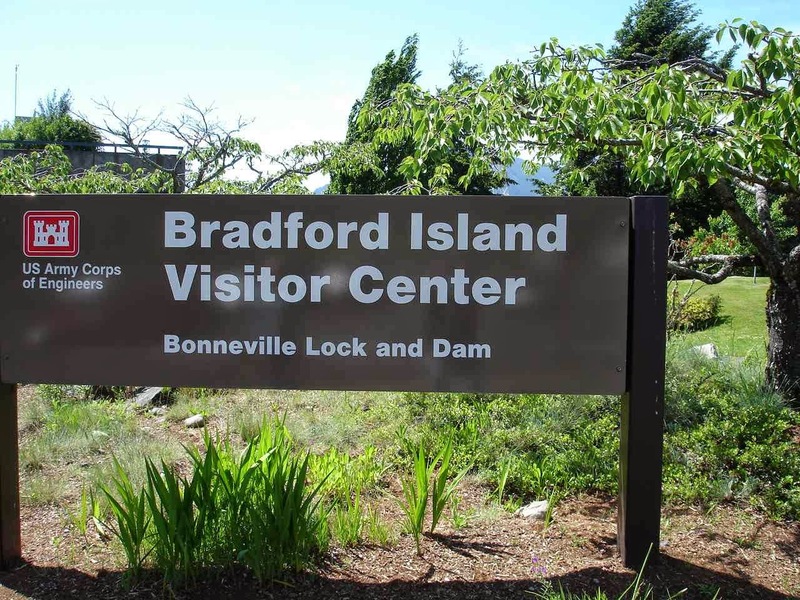 There are other stops along the Columbia Gorge, but one that is definitely recommended is the Bonneville Lock and Dam. Another WPA project during the depression, the desperate work force flocked to this project, no questions asked. 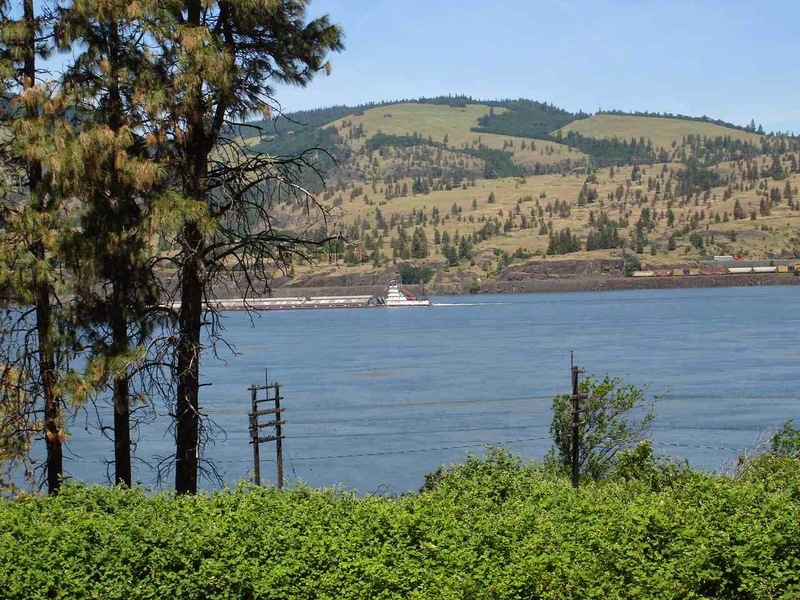 While some members of Congress questioned the need for such a large hydro-electric project in the northwest, they were soon silenced when the electricity became all important for producing planes and one Liberty ship per day from plants in the northwest during WWII. The flow over the spillways is impressive and loud. 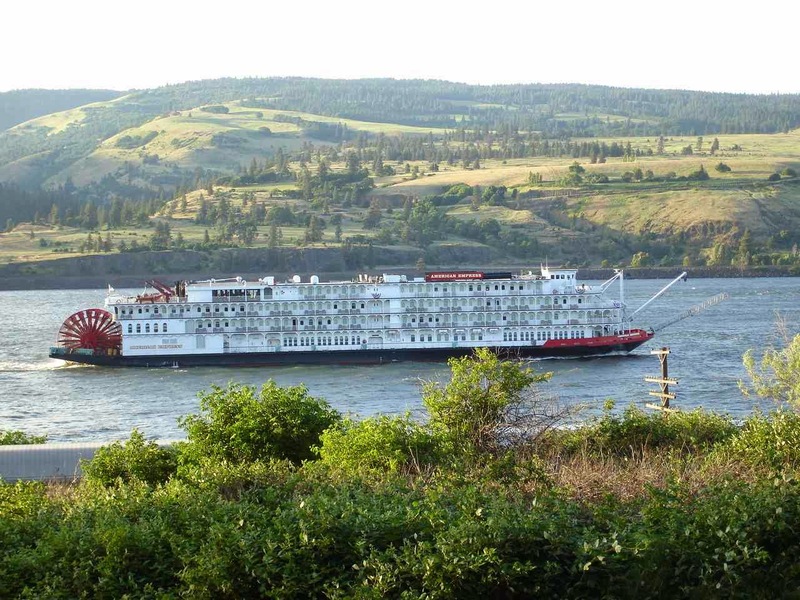 The area is large with three producing turbines, locks for moving large and small boats and barges, and a great fish step. The first floor has a number of see-through panels to watch the fish swim upstream past the dam. 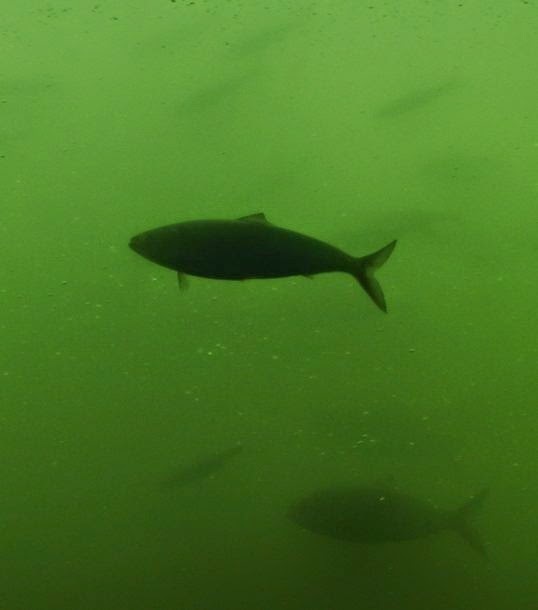 I don't know what type of fish this is, but we saw many like this as well as a few larger salmon. 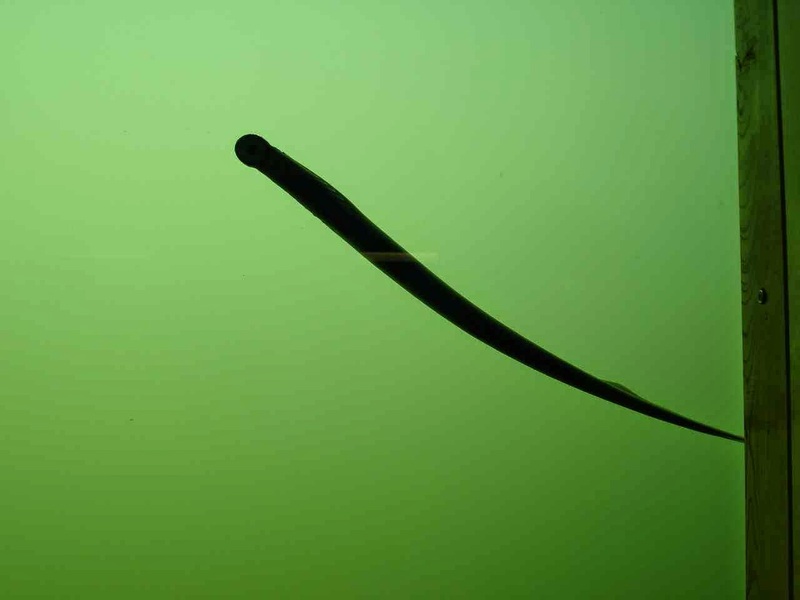 We believe this was a Lamprey eel. He was just sticking around on the glass. Jan is standing in front of the old turbine from one of the sections that had been replaced with a newer model years ago. 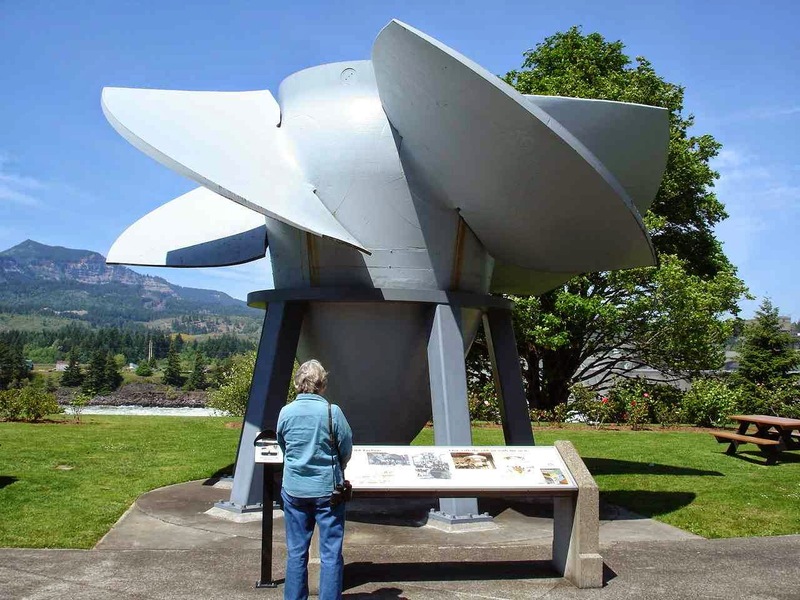 The Columbia River was great for this project because of the volume of water and the force to spin these large turbines. 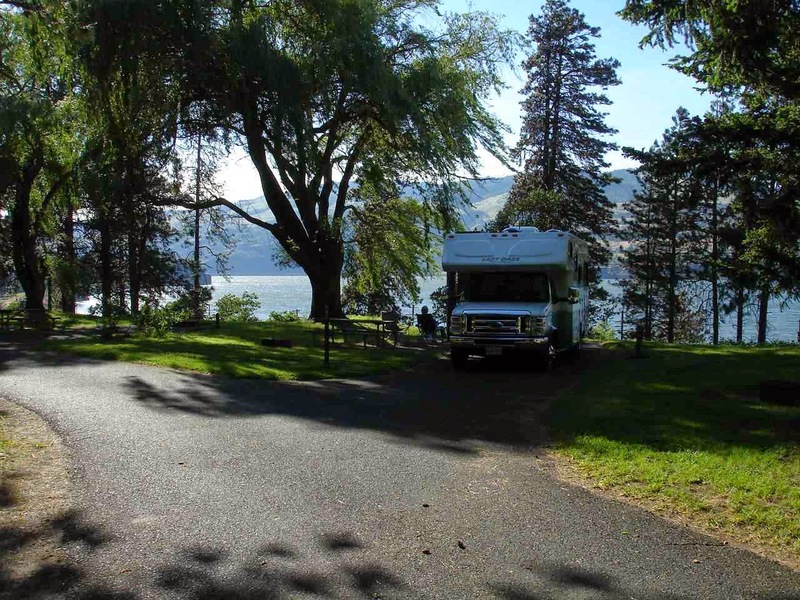 We are now here at Memaloose State Park in Mosier, Oregon , right on the Columbia River. 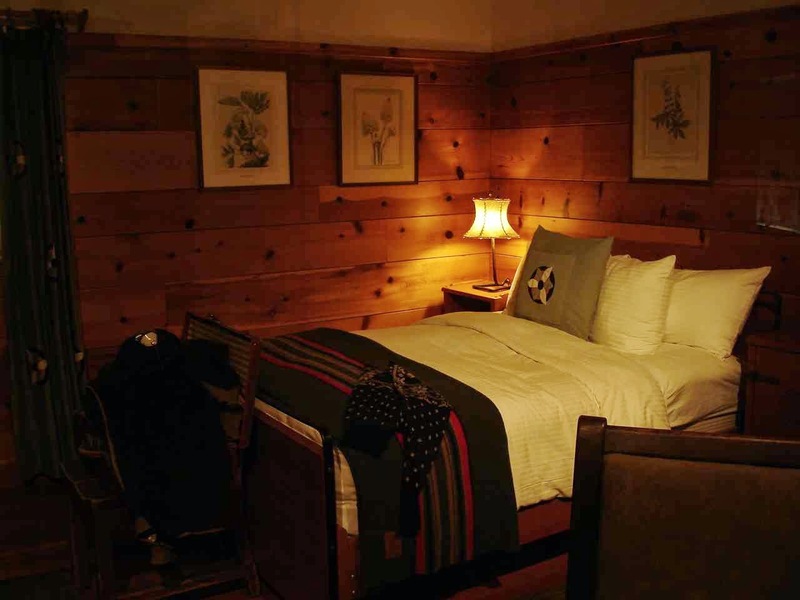 A great little spot with water only for $19 per night. All kinds of river traffic in front of our site. Not to mention, barges and trains on the Washington side and also right below us where you see the power lines for the track equipment. I've counted up to 100 plus cars on many of the trains and there are usually at least one or two per hour on each side. Not a bad spot for a sunset either. However, Memorial Day weekend starts tomorrow and this park will be full. 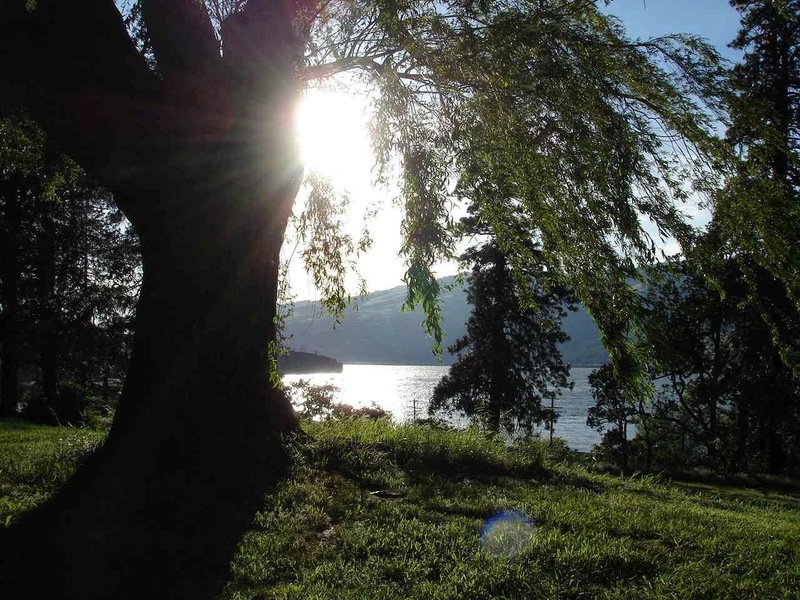 With no reservations, we will take our chances across the river. 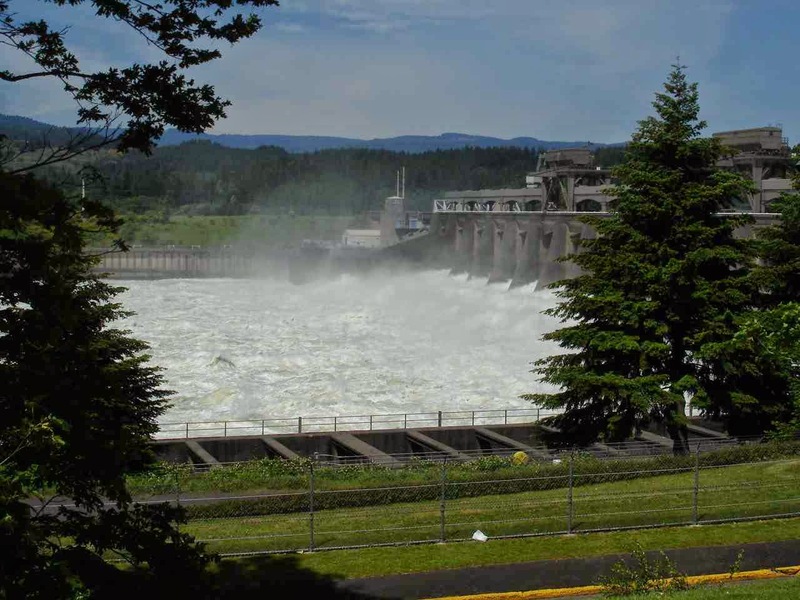 If you ever find yourselves inclined to volunteering, we spent three months with the Corps of Engineers at Bonneville Lock and Dam. 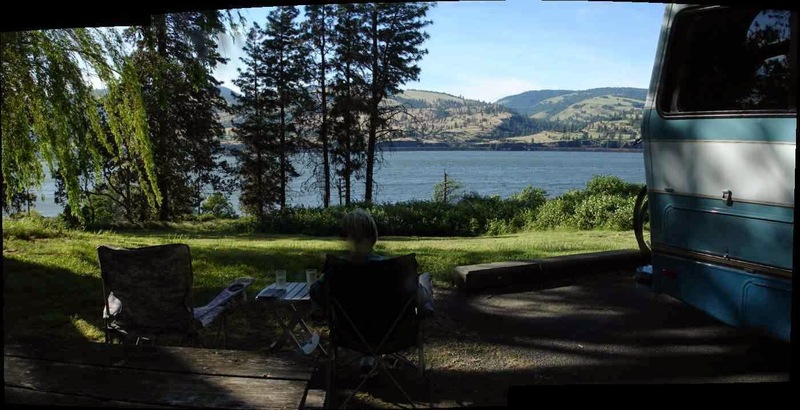 It was a fun place to "work", they treat the volunteers very well and you get to stay on Robin's Island in the middle of the Columbia River. Hope you landed a good spot for the weekend!